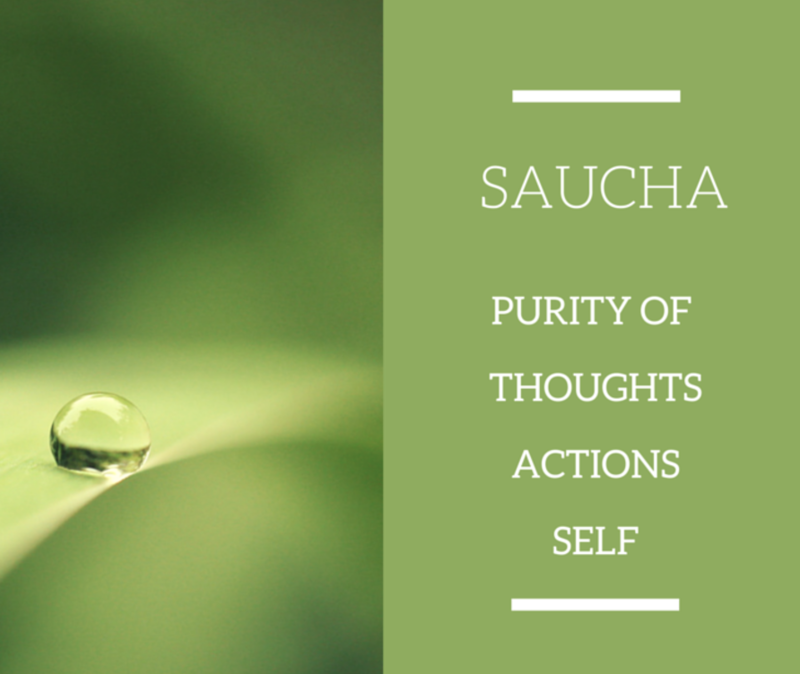 Our theme for the month of October is Saucha. The first of the Niyamas, Saucha can be translated as cleanliness, purity, or clarity. It refers to the purity of body, mind, spirit and surroundings, and is a practice which helps us to move towards pure and positive life. Within the 8 limnbs of Yoga, the order of the Yama’s and Niyamas significant, so while the practice of Yoga is not necessarily linear, it is important both that Saucha is the first Niyama, AND that the Yamas and Niyamas come before Asana. Traditionally, The Hatha Yoga Pradipika prescribes a series of cleansing techniques or shatkarmas that should be done before even considering a physical asana practice (some of which – like Neti Pots, or khaphalabhati are still popular today (others of which can be researched online for the not faint of heart / digestive track 😉 ! For many of us, the physical Asana practice is our primary connection to Yoga, however if we are approaching the practice without putting at least equal attention to the Yamas: such as Ahimsa (non-violence) rather than aggression, Satya (truthfulness) rather than Ego, or Tapas (discipline) rather than laziness – our practice will be unpleasant and ineffective at best, and injurious at worst. Our ability to connect to not only our body, mind, and breath, but also that more subtle and divine energy which we all share, and which makes the asana practice different than other physical endeavors, is dependent on our being able to feel and discern things clearly – without impurities or obstructions. Imagine practicing in a dirty, noisy room, directly after having a very heavy meal and a few drinks – that lack of purity within and outside would likely render the practice impossible. The same is true off of our mats. When our physical surrounding are dirty or messy, it is often really difficult to focus or be efficient in our work – and even in a clean space if our mind is cluttered it is difficult to be present, calm, or focused. And yet, while purity is an important and perhaps essential pre-requisite for a thriving practice – there can be a danger of focusing so hard on ridding ourselves of impurities that we begin to reject integral and essential parts of ourselves. In the words of Thich Nhat Hanh: “No mud… No lotus.” So how do we practice Saucha faithfully but not aggressively? As it often does (in our opinion!) it comes back to that balance with the other aspects of Yoga – starting with the Yamas and Niyamas. Is our purification done with kindness and non-violence? (Ahimsa) Are we being truthful to what our bodies and minds really need (Satya) or are we choosing a diet/ exercise/ or physical space based on some external standard ? Are we allowing for Contentment in the here and Now (Santosha) as well as discipline and fire (Tapas) to make the necessary changes for deeper clarity and purification? Ultimately, all the Yamas, Niyamas, and our Asana work towards that connection: with breath, with body, with the mind, with ourselves – so that we can connect to something greater. As we practice Saucha we want to find the Lotus without destroying the mud that was, and is, vital to its existence.